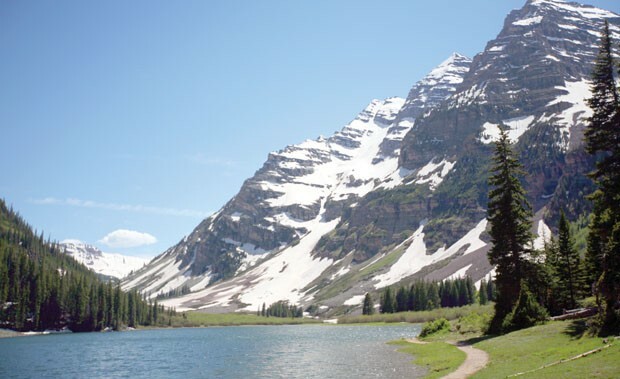 The Four Pass Loop in the stunning Maroon Bells is a Colorado classic and it can be completed as quickly or as leisurely as you like. This 22-mile GPS-plotted loop covers the basics, plus it serves up suggestions for a number of side hikes and variations to make the trek longer. 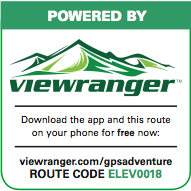 Download the free ViewRanger app and this route to your mobile device and make it happen. The Maroon Bells are widely reagrded as the most photographed landmark in Colorado—it’s easy to understand why. The twin peaks with their strong horizontal striations that often hold the winter’s snows well into the summer blend the beauty of Colorado’s distinct and envied seasons. Most people who photograph the Bells barely make it out of the parking lot to Maroon Lake. Some will actually day hike up to Crater Lake where many more a photo has captured the reflection of the Bells. But only a brave few go beyond and into the wilderness that surrounds these towering peaks. Shoulder your pack and download the GPS points for the route, it’s time to see the Bells from all sides. Depending on what time you get started and how ambitious you are, consider heading to the top of the Bells. Grab these coordinates and look for the “bent” tree (can’t miss it). The trail junction is just about 50 yards past that. Make a small camp at the junction so you can get up early and hit the summit with a day pack then push on. Your first of four passes ties for the highest with the last pass at 12,500 feet. Soak in the views looking up the southern ridge of the Bells and press on. Frigid Air Pass isn’t far away and from there you’ll get your first solid glimpse of the back side of the famed peaks. Drop into the basin and enjoy cruisy contours that follow the flow of the North Fork of the Crystal River. Be savvy to backcountry camp conditions and find a cozy spot somewhere along this stretch to get rested up for the push up the next pass: Trail Rider at 12,420 feet. Well over half way around, Snowmass Lake is a bit of a grand central station in these parts. A number of routes lead to it from various trailheads so you might see other folks here. Another side hike starts at the lake to the summit of Snowmass Mountain which squeaks into the 14’er club with 98 feet to spare. If you have the time, plan two nights here to notch the 14er in your belt or just chill out. The challenge to connect all four passes is accomplished as you crest at 12,500 feet again. It’s pretty much all downhill from here. Follow the drainage towards Crater Lake and keep an eye out for the familiar face of the front of the Bells. That wild high will fade on the last leg as you start to pass lots of day hikers (who will all be impressed with your backcountry aura) and you are sure to be asked a number of times what the hike was like. Give it to them straight—odds are they won’t be doing it anyway.